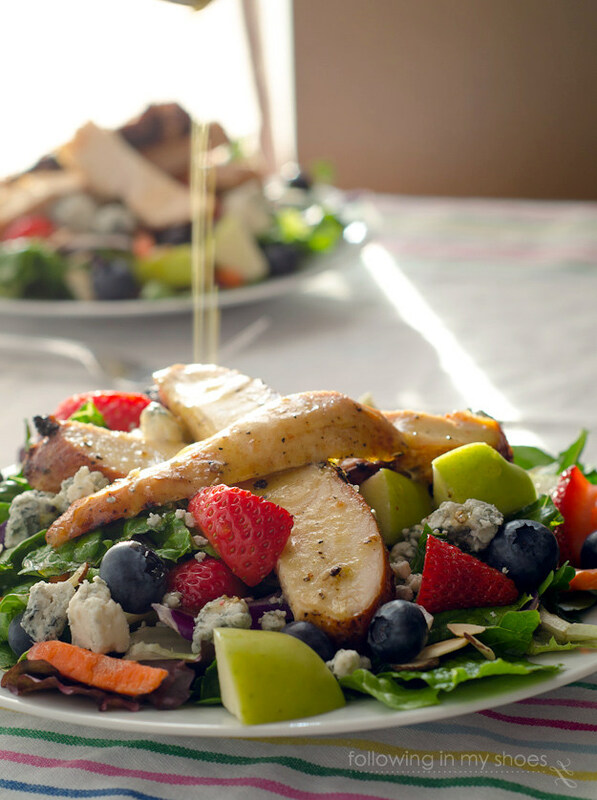 This recipe is honor of all of those who adore Chick-Fil-A’s new Grilled Chicken AND their Grilled Market Salad AND their Zesty Apple Cider Vinaigrette. I. Am. Obsessed. with the Chick-fil-A Grilled Market Salad. Spicy Chicken. Fruit. Bleu Cheese. 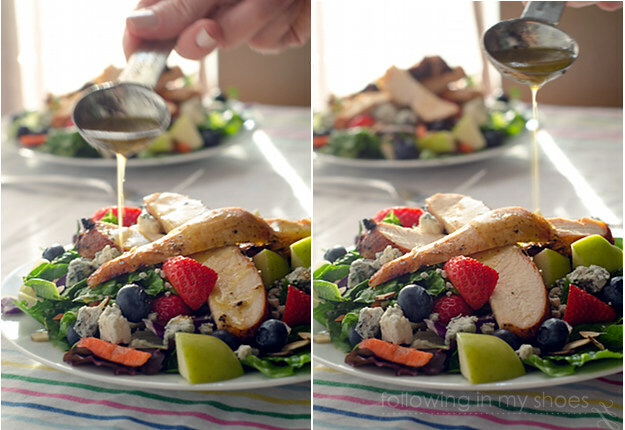 And that tangy Apple Cider Vinaigrette. Mamacita, I lurrrrrrrrrrve that stuff! It is, hands down, my favorite salad of all time and, when Chick-Fil-A introduced their new Grilled Chicken … well, I grew to love it even more. 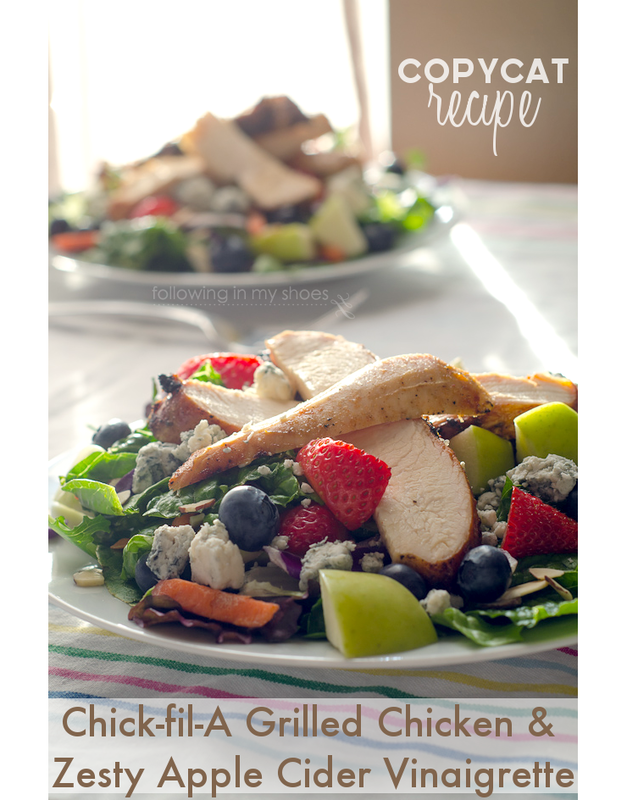 When I finally cracked the recipe, making a Copycat Chickfila Grilled Market Salad, discovering how to make the chicken, the salad, AND that infamous dressing at home, the Husband became a fan too. And, the Kidlets raved and raved and raved and RAVED about the chicken. Y’all, this chicken marinade is the absolute best chicken marinade and is my new “go-to” recipe when grilling chicken. Regardless of whether or not you use it to top a salad, it’s absolutely delicious. The Little Lady ate her portion of grilled chicken, asked for seconds, and then stole pieces from the plates of her brothers while they were glued to an episode of American Ninja Warrior. Mix all ingredients in a bowl or plastic bag (make sure to increase measurements if doing more than one breast). Add the chicken. Marinate 30 minutes - 2 hours. Prep your grill, getting a medium-high heat (roughly 375-400 degrees). Remove the chicken from the marinade and discard marinade. Place the marinated chicken breasts over direct heat, grilling for 3-5 minutes per side -- until an internal thermometer registers a temp of 160 degrees. Remove from heat to a plate, covering it with foil. Allow the chicken to rest another 5 minutes or until an internal temperature of 165 is reached. Slice for a salad or serve as desired. Briskly whisk all the ingredients together to emulsify/thicken the dressing. Enjoy how easy it is and chow down!